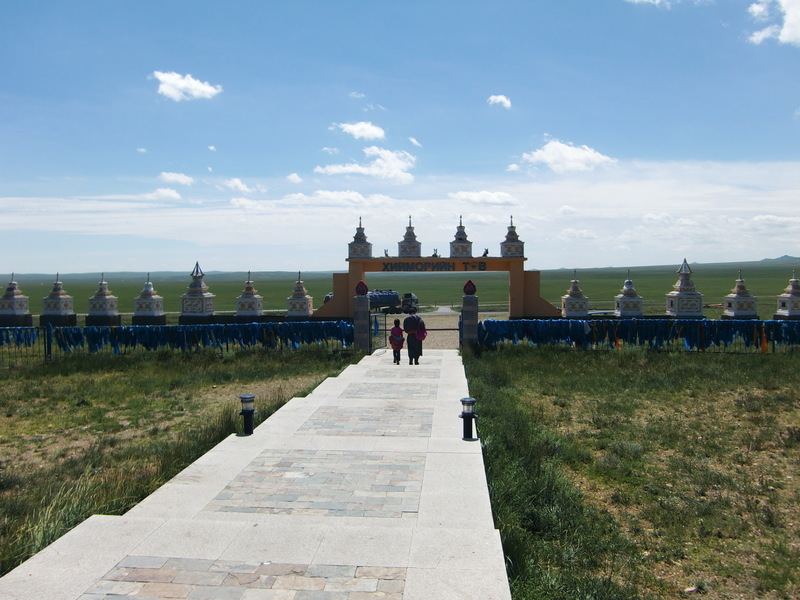 So , finally we got here, we had a big stress relieve as now we have a whole month to get to Ulann Baatar. Time to chill, however its still 1600km away. 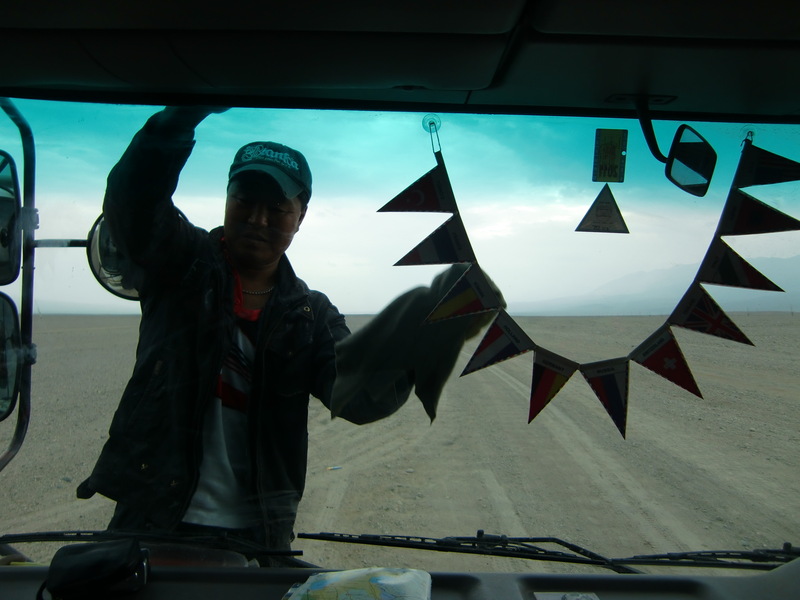 We fill up 8 litres of water each and head out towards Ulaangom, with the intention of getting to the Ureg lake. Basically north of Olgi. 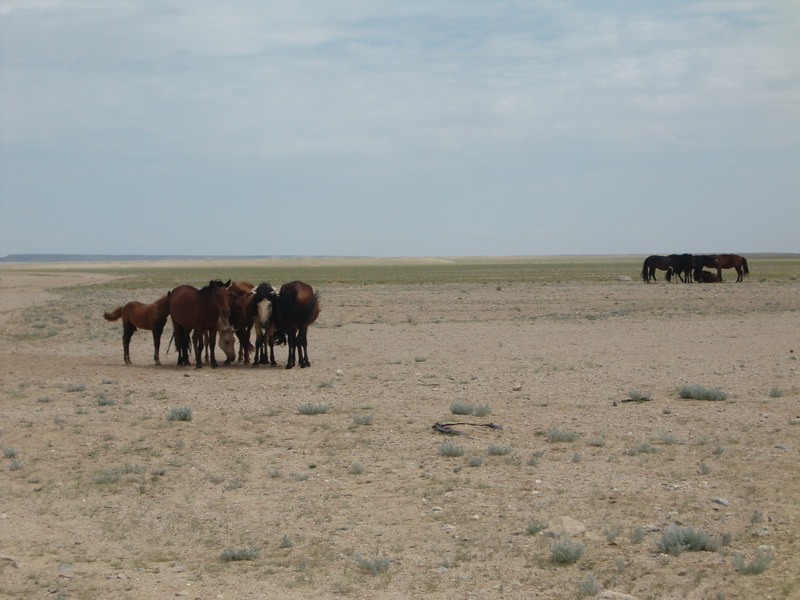 once arriving into Mongolia a big crowd surround us to observe. We put our stuff on the bikes and amelie decides to change her tyres to our new big fat tyres,,, 42 thick instead of our 28s. 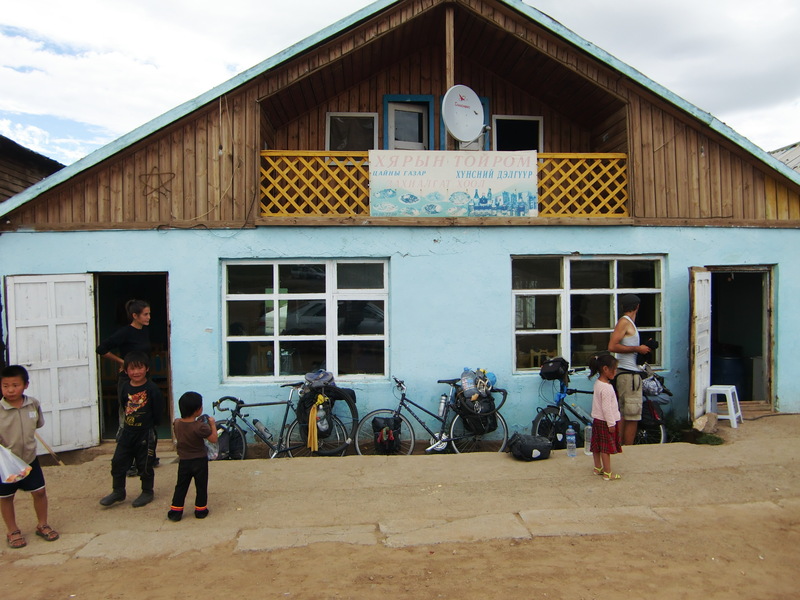 muz decides to change his tyres later as too many kids around playing with our bikes and stuff, a bit like the bike workshop at info 56a…. ha ha so we head on and amelie gets a puncture after 500m. we stop, fix, eat and play football in the sun. 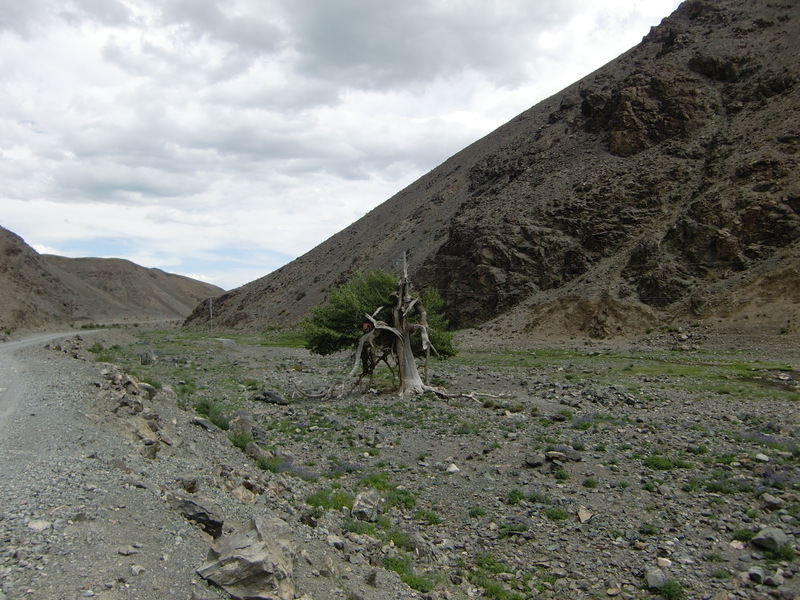 later on we get to Tsaaanuur, with the help of a little hitch, we realize that to get to Ulaan Bataar (U.B) in time we have to hitch a bit. 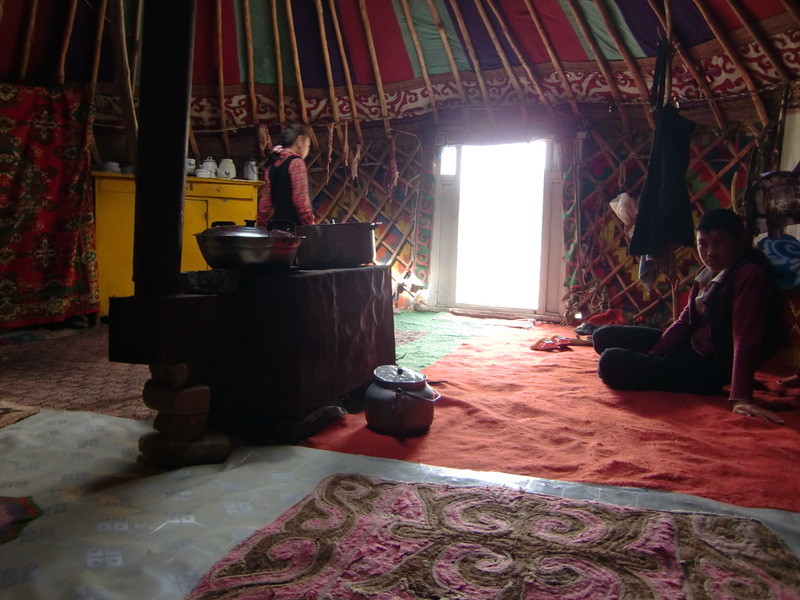 At tsaanuur, we find out they all speak Kazak, infact this is the Kasak region of Mongolia, we visit a Ger have tea, then camp at the lake. Wow. Beautiful stuff, we about 2500m high up so no mosquitos. In the morning we wake up and have rice pudding for breakie, the boyz go wash in the lake and muz cuts his hair and goes for a jog. 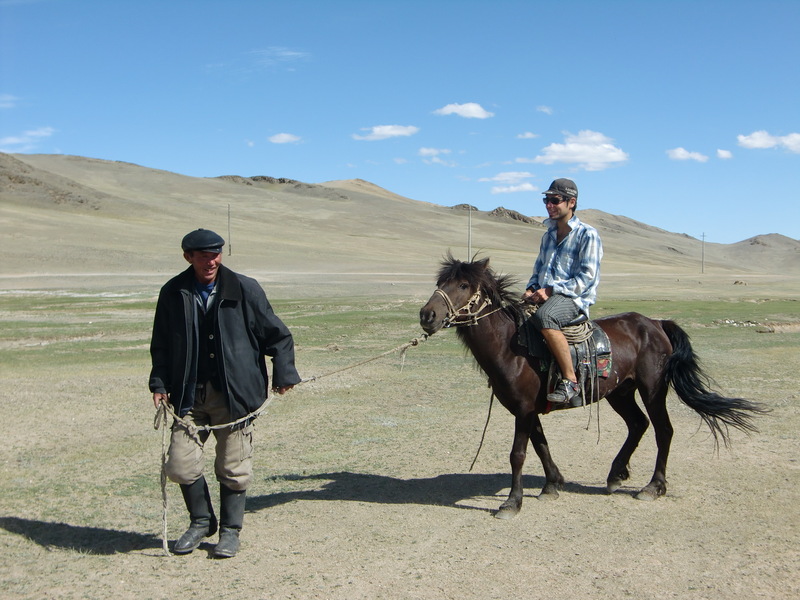 Many mongols pass by and stop to say hi, most of them on horse back, others on motorbike. The acting of saying hi, is carried out by sitting next to us and just observing. No hello , no attempt of asking questions, actually sometimes a hello. Its so nice, so peaceful, .a bit like a human zoo. amelies tyre explodes like a bomb, after riding 500m again so she changes to the old 28 tyres as we realise our new ones are CRAP! 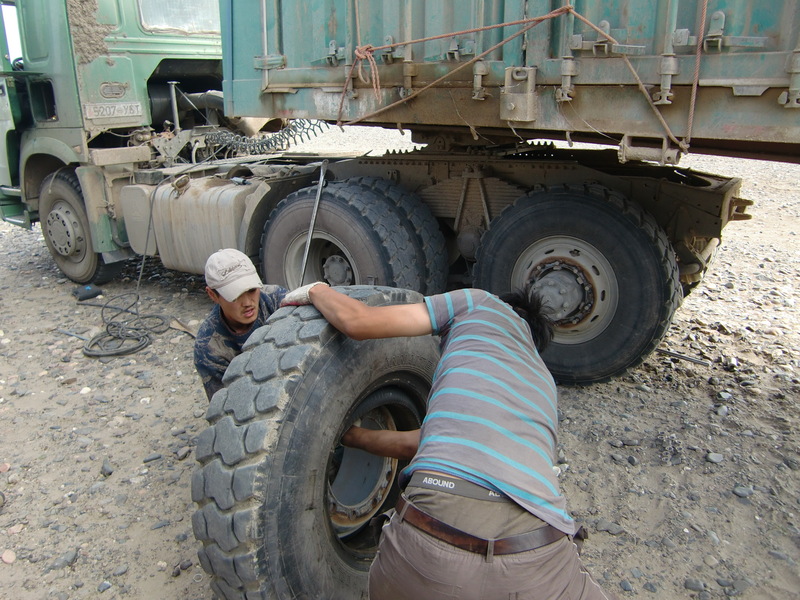 We are probably the first to attempt Mongolia on 700* 28 tyres…. Especially on the northern route. At Nagoonoor we find a shop and buy rice and noodles for a few days, they tell us to take the main road to cross to next the town as the small road crosses the river and its too high to cross on bikes. We listen to the locals and take their advice. We head out of town aiming to hit the main Rd. by the way guys, we are not talking asphalt or rocks or anything, we talking just tyre tracks. We reach a point where there are many tyre tracks and assume it’s the main rd. we look at the compass, surrounding mountain summits and decide to cycle on. 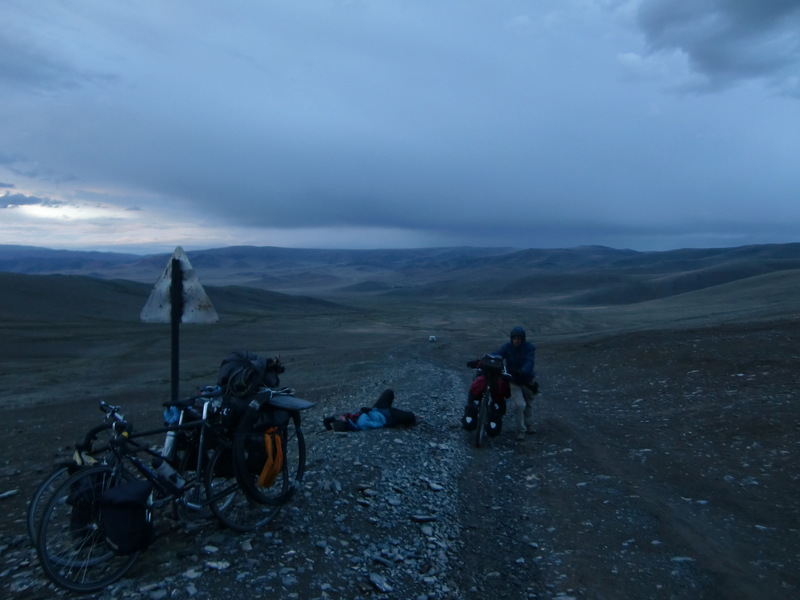 Its ride-able, we stop for a break and mosquitos start feeding on us immediately when the wind stops dies down. Therefore We realize we getting near a river. We cross the river no problem, so many mosquitos tho. After some while we cross again another river. 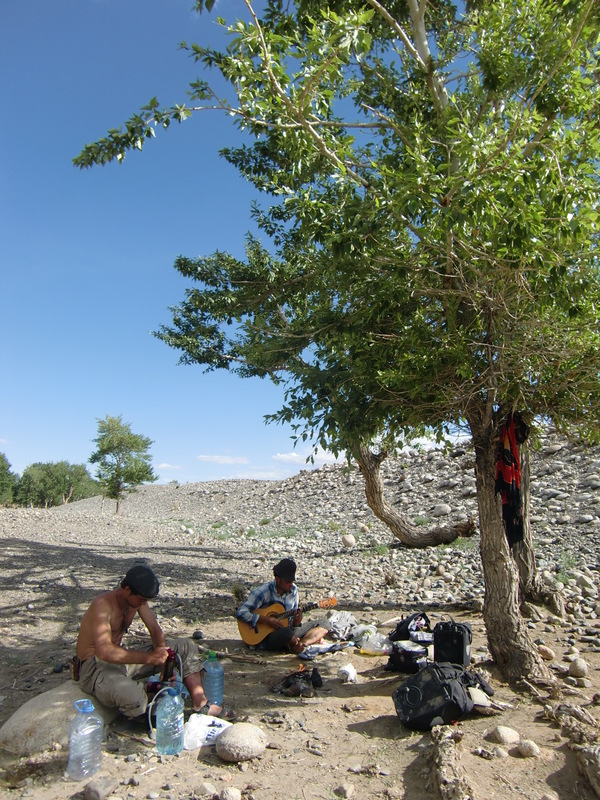 We camp on some sand, rock formation, feels a bit like a dessert in way. Amazing. 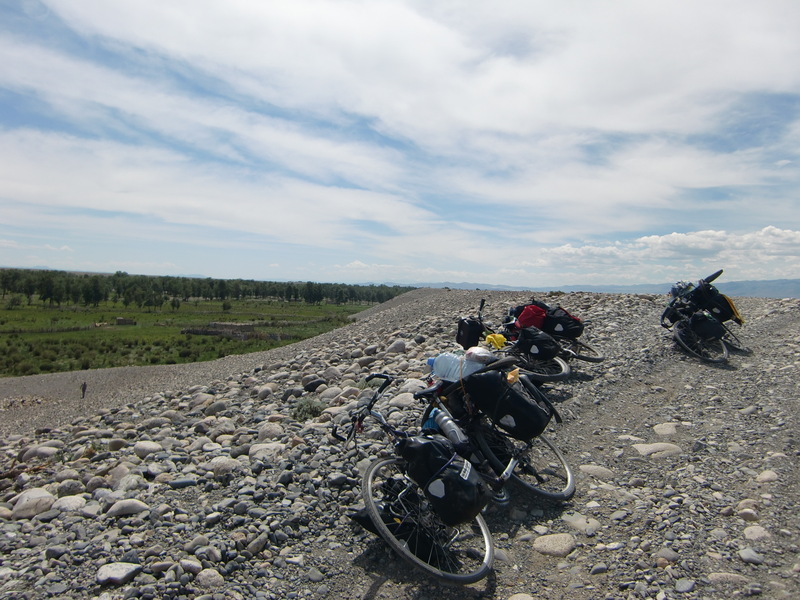 The next day we push our bikes all day pretty much as the road is really bad. 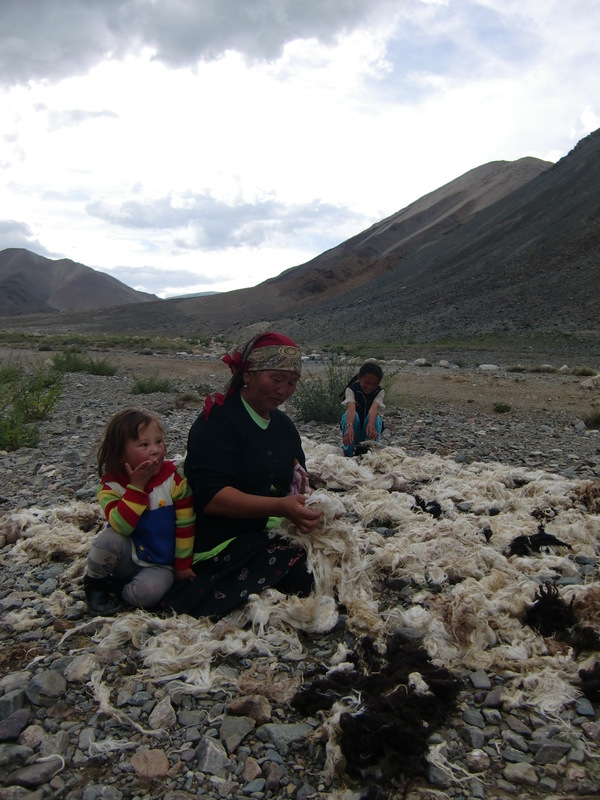 We get to the 3rd river and talk to locals, they indicate to us the direction to get to the river crossing. We get to the village, nobody is around, just loads of mosquitos. 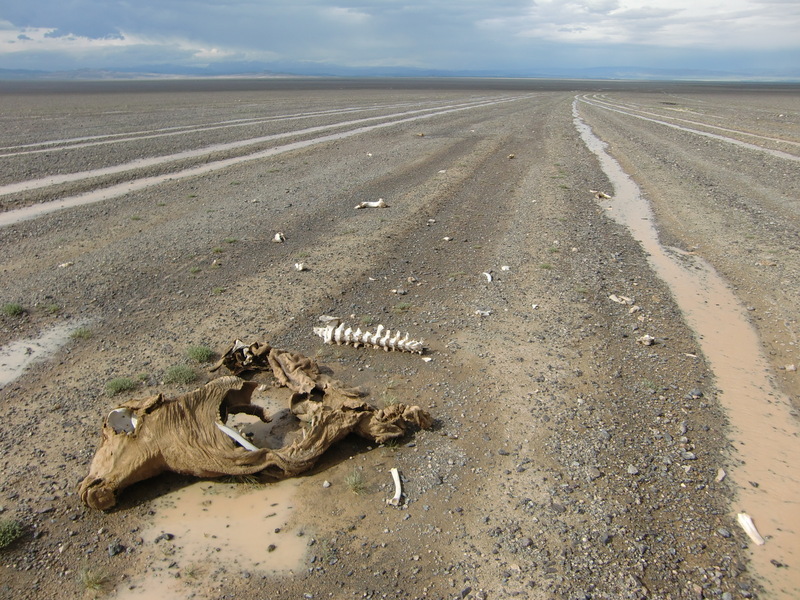 Everybody is at high altitude we presume as all the mud huts are abandoned here. 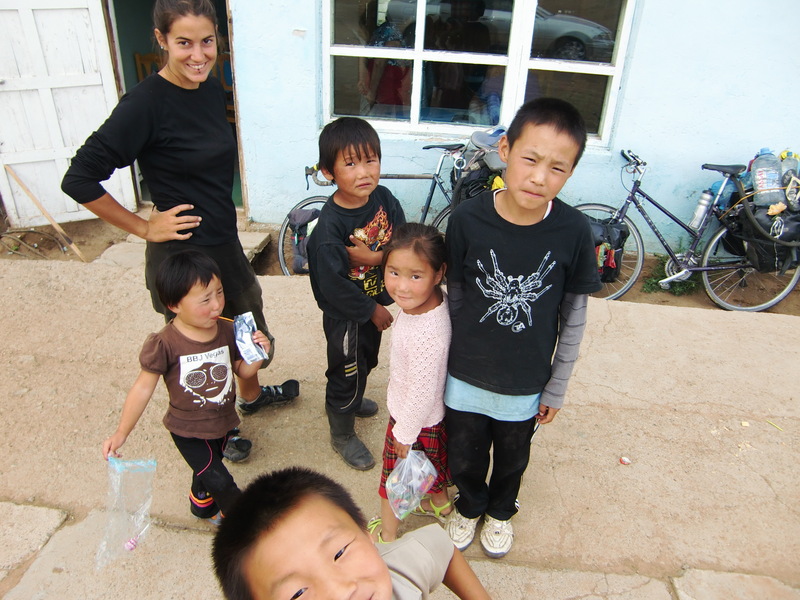 We take a walk around the village , cover up for the mosquitos and try to find the river crossing. we see that the river is too large so we sleep and decide to try cross it at another point in the village. 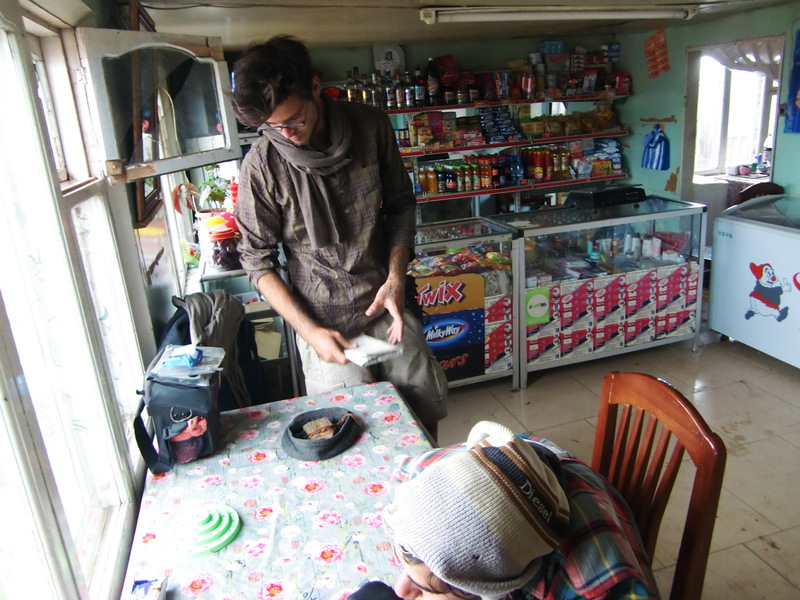 The following morning we realize that we have little rice left, not enough to last us to the next town, maybe 5 days away.we start getting worried and start thinking about starvation.. wow first time it feels like a real adventure.. ((actually second time)). We decide to split tasks, Cartasan heads bak to get more rice, Muz heads out to find a crossing, and amelie filters water. We meet up later, cartasan has rice and sweets for exchanging his bottle of vodka, muz thinks there is a way to cross the beasty river, and we have drinkable water.. all is good.. we head through the swampy region looking for the crossing. 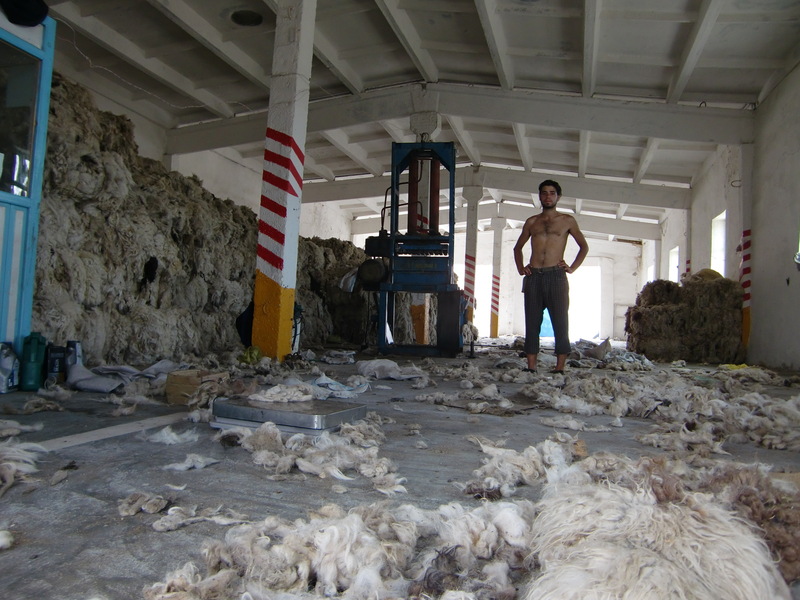 we reach the men from before working in the field. The same men that gave us directions. They tell us to head back the way we came from and cross at the skool. We tell them that we camped there and we found no suitable crossing, they say head that way and at some point turn a left. We head bak, get to the skool and have lunch. We get frustrated, as this river crossing seems impossible. We look at the map and wander if we are the right place we think we are. We look at the skool, and the door reads ‘’Uchutuul skoola’’, we realized we are in the wrong place and in some other village on the map. we had got totally lost. Ha ha. It explains why we couldn’t find the crossing and why the road was so bad. 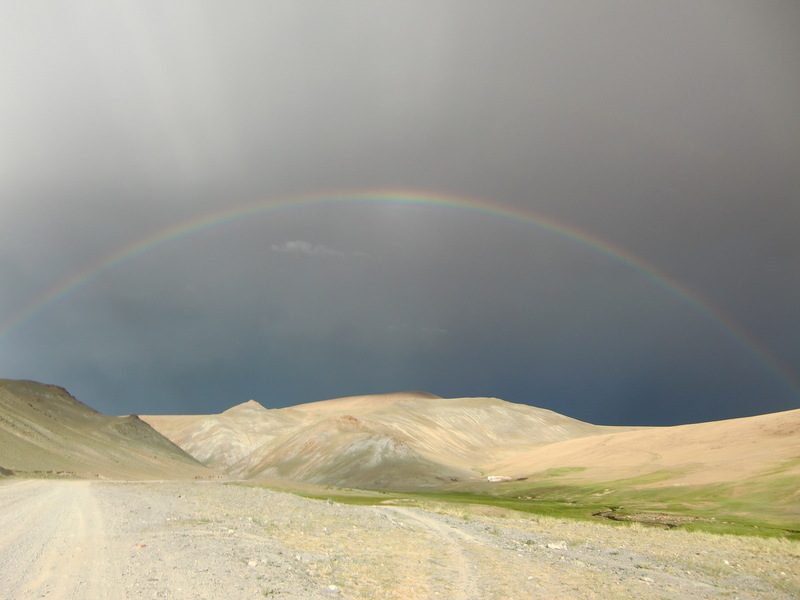 So we head to the crossing, the one on the map, we push for 15kms, a storms arrives and we take cover under a truck with the Mongols. They too are trying to cross this river. They tell us that the crossing up the road is too dangerous too high and not possible to cross on foot. They show us another place. They cross it to get to their house to pick up a machine part for their broken down truck. It takes 3 of them all linking arms to get over. We attempt the crossing, the water current is powerfull, Kartasan gets to the outside with his lanky legs , muz gets stuck in the middle and amelie watches from the bank thinking ‘’oh my God’’. We realize to cross with bike on heads would be too risky and decide to give up. The aussies we met took the road south of the big lake and not the main rd, we took the main road as they told us it would be less bumby and not a big sand dune. In fact it would have been better to take the aussie way as south of the lake the river would have been tiny to cross. 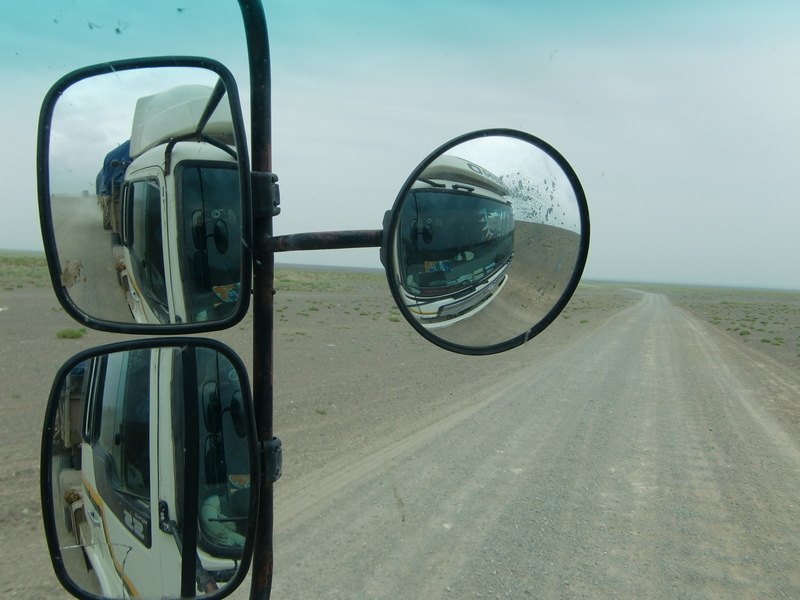 Anyways we decided to head back to Tsaganuur and take the south route to U.B. 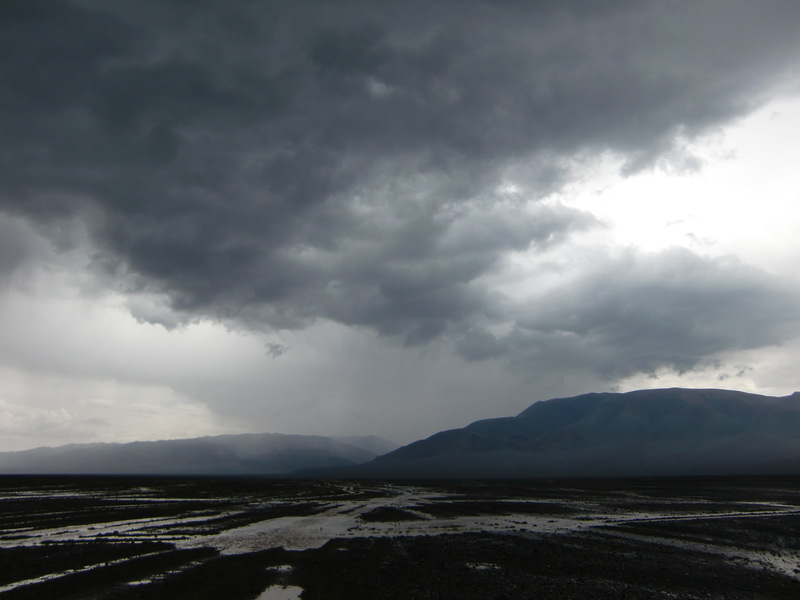 After a few days, and some storms, we get back to the tsaganuur lake. 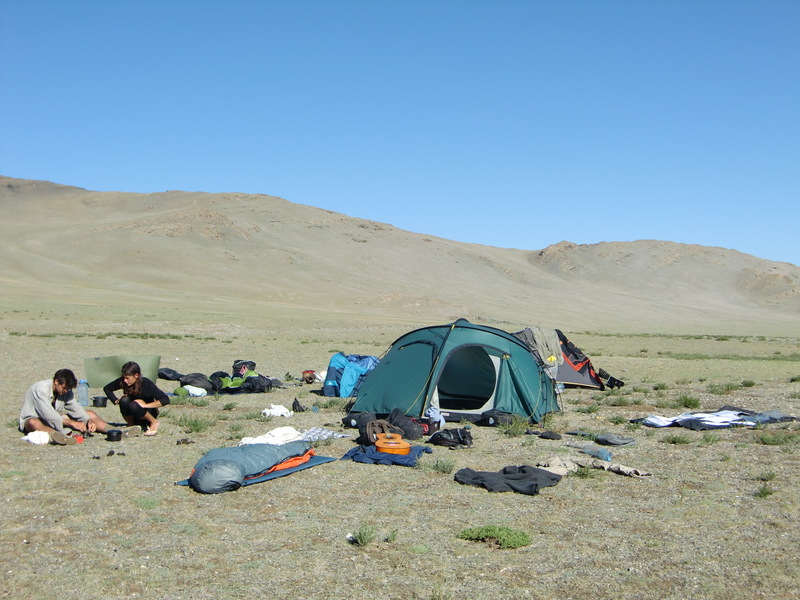 we camp exactly where camped before and find some of our equipement that we lost from the first camp. Amazing stuff hey. 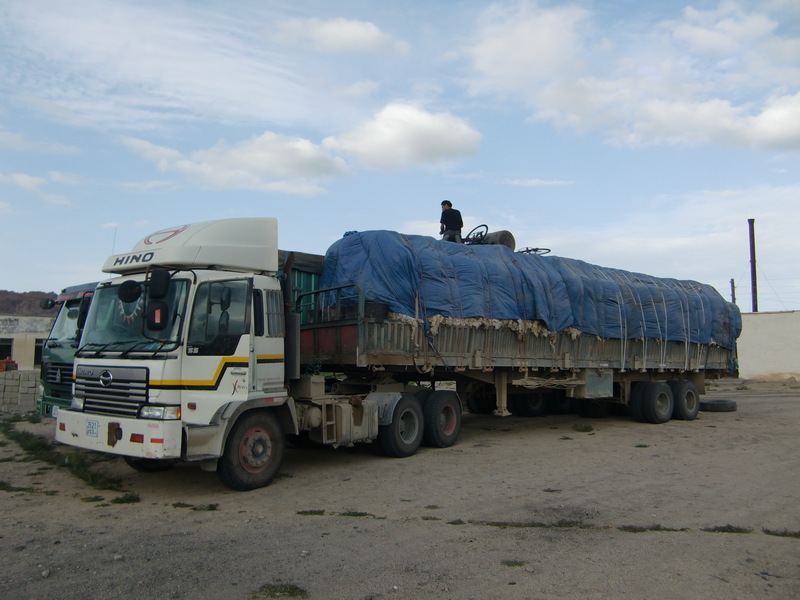 After Tolbo, we hailed down a lorry heading our way, he was heading to Hoft to load up and then to U.B. 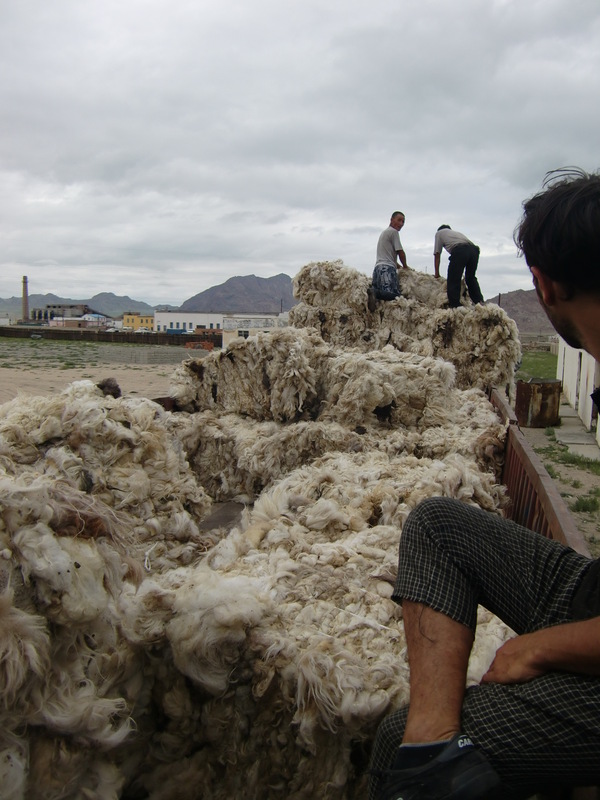 so at Hoft we spent the whole day loading up two lorrys, with wool. 20 tonnes on each lorry. Hard work. 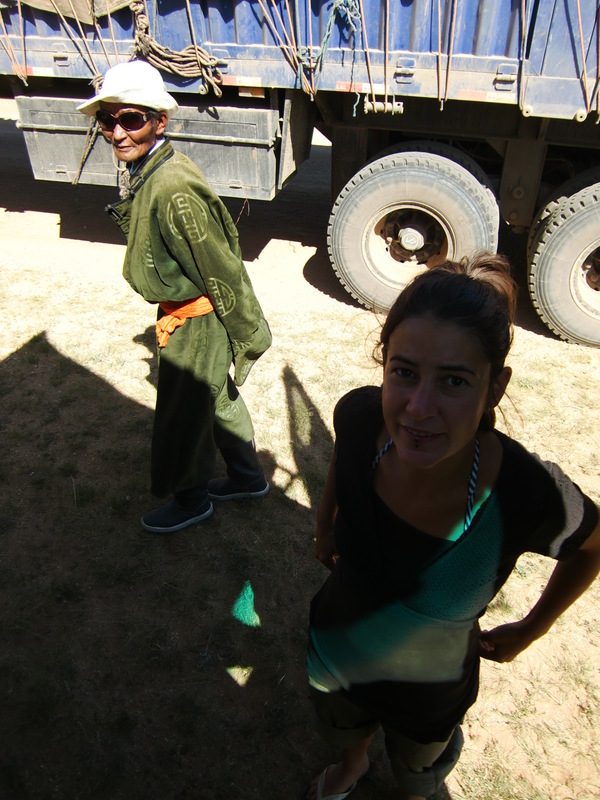 We decided to take the lorry ride to the asphalt, with them, a five day ride. The next day we found our musketeer KartaSan on the road, so we picked him up as well. 3 bikes on top, U.B. here we come. Once on asphalt the ride to U.B was heaven, a bit windy at one point, but still really nice. 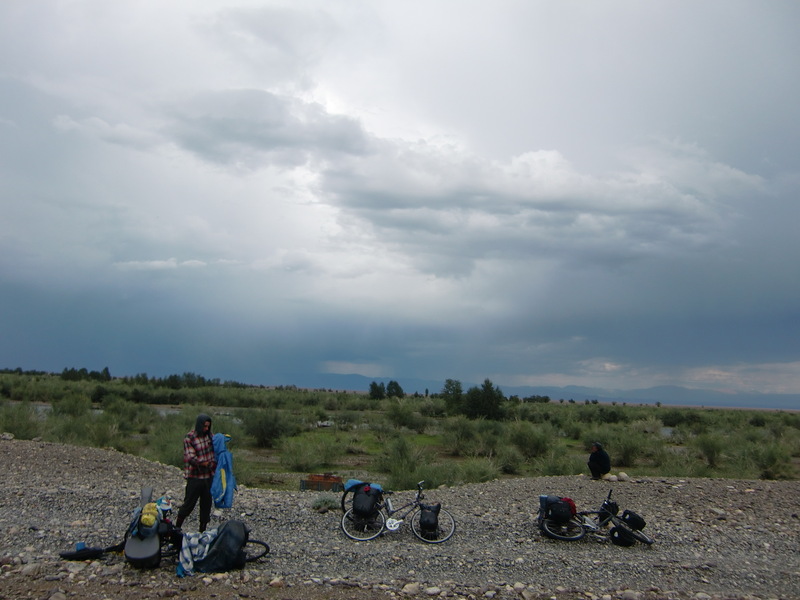 Oh forgot to say , in the west there are big storms, one time while crossing the mountain top a storm arrived, we abandoned the bikes and kneeled under the tent-top 15m away from our stuff as there is the risk of being struck by lightning when high in the mountains. Ha ha,, it kinda worked but muz was touching the ground and he got struck !! well not directly, the lightning must have Hit the bike or something and travelled along the ground. Muz was energized good, like rechargeable battery. All is good tho, he still alive. Another short story; we camped just before a storm one evening near the bottom of the hillside. When the rain came, it came hard. After 10 minutes we felt a little puddle emerging under our tent, ‘’wow it must be raining hard hey’’ said rootzbiketour. 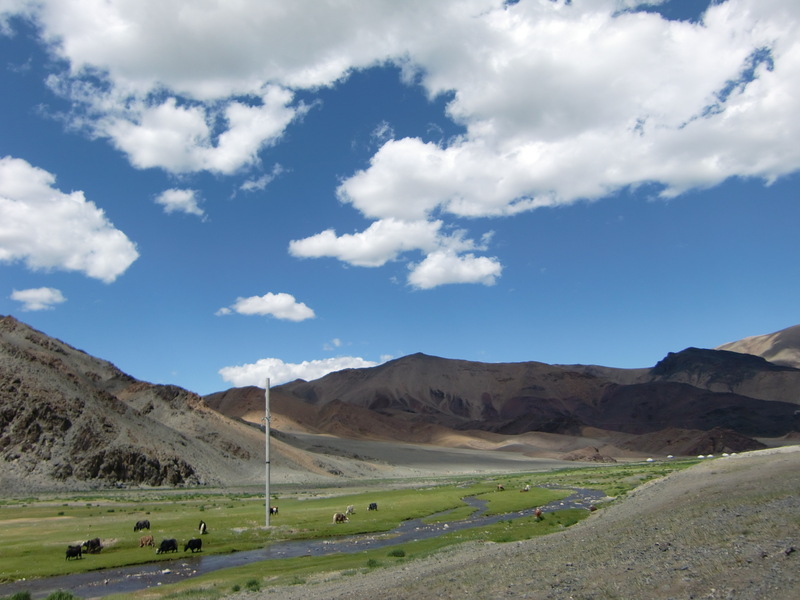 KartaSan, our bike companion, says ‘’ hey guys this is great it feels like I am sleeping on a water bed””.. “amazing”. We look out of the tent and realize we are a foot deep in a stream/river. ‘’oops’’ the next day we spent drying everything and rescuing stuff that got washed away. 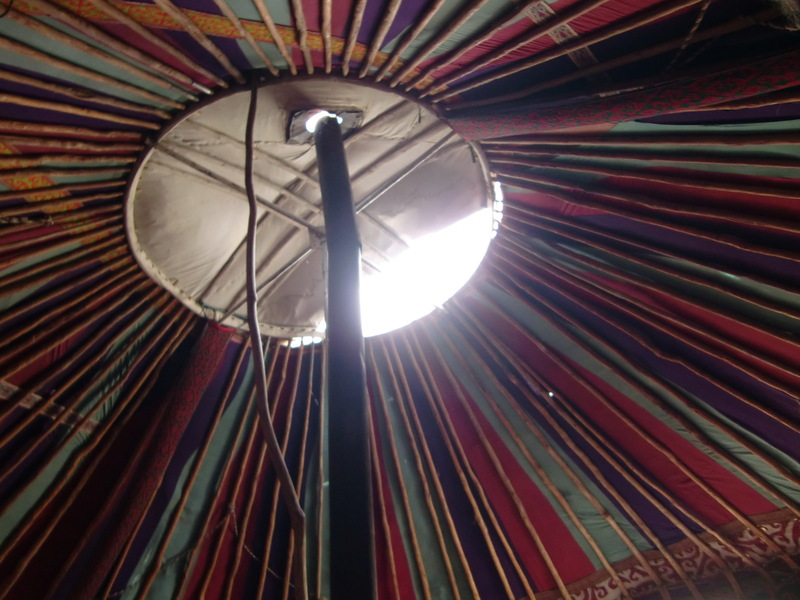 Our tent rods broke from lifting the tent, we learned not to lift the tent when stuff is inside. But hey it was dark, and we panicked , so be easy on us please. 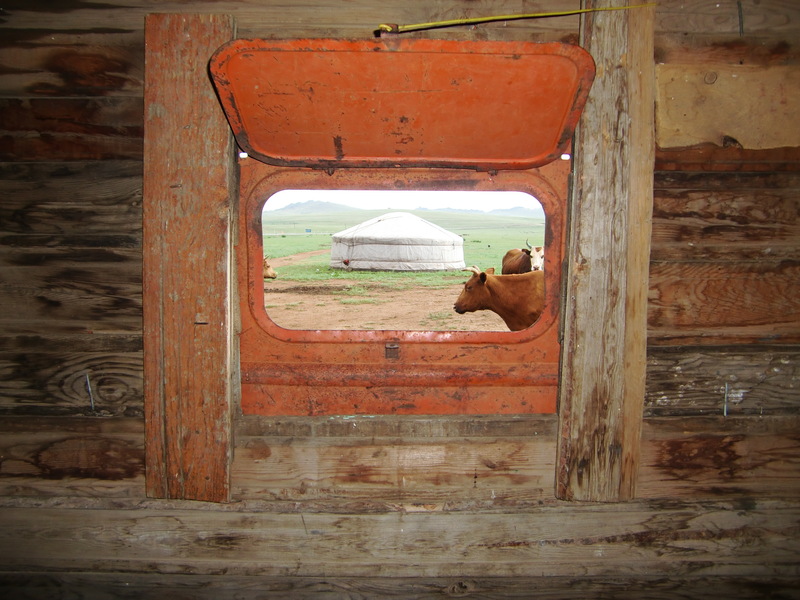 Mongolie Mongolie… Magnifique pays d’aventures! C’est le wild east! Tout allait bien en arrivant, on decouvre les prix, beaucoup moins cher qu’en Russie et ca fait plaisir! 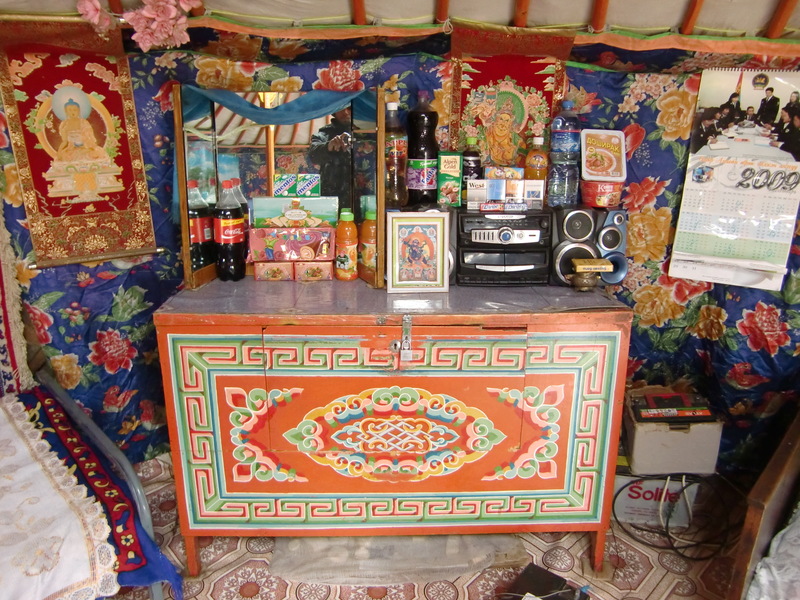 On decouvre aussi toute la viande, et la ca fait moins plaisir.. On le savait deja, la Mongolie n’est vraiment le paradis pour les vegetariens.. Donc on se dit juste qu’on va tout le temps cuisiner et pas manger dans les resto/cantines, mais on a vu plus tard que c’etait possible.. Amelie change ses pneus tous fins et Murat se dit qu’il le fera plus tard. On a achete des pneus russes a 3euros chacun a Almaty, en pensant bien que c’etait pas de la super qualite, mais c’etait les seuls qu’on a trouve. 1.5kmplus loin, crevaison! Super les pneus! Reparation, restauration et on se fait prendre en stop : y’a pas beaucoup de voitures qui passent, mais on decide que si une voiture qui peut nous prendre passe, on fait du stop car on a qu’un visa d’un mois, encore, et 1600km a faire… Ils nous emmenent a la prochaine ville, qui n’est un village. 500 metres a velo plus loin, le pneu eclate, carrement! Donc on decide de remettre les anciens bons pneus continental anti crevaison, parce que a ce rythme la, on est pas pres d’arriver a Oulan Bator! On decide de prendre la route du nord pour Oulan Bator, car il y a plus de lacs donc plus d’eau. 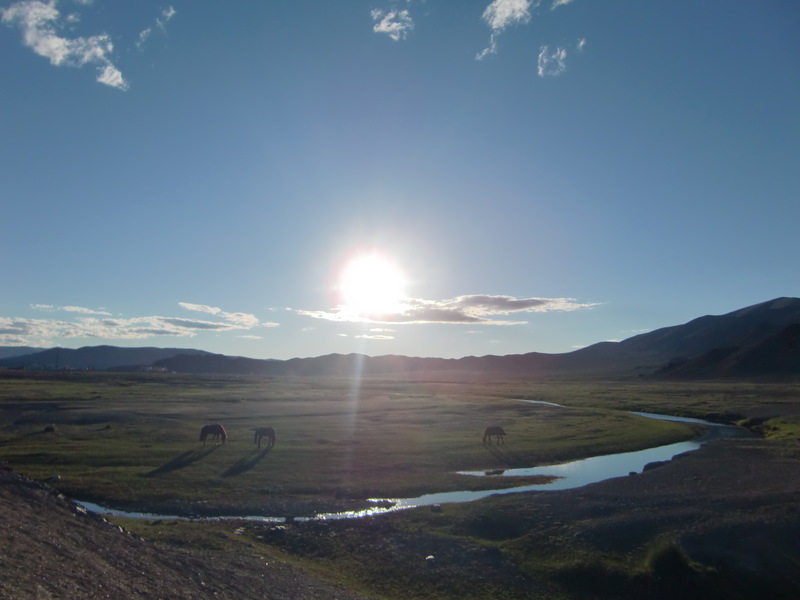 On campe d’ailleurs le soir pres d’un lac, heureux d’etre enfin en Mongolie. Le lendemain, on re-fait du stop! Ils nous emmenent dans un village dans notre direction mais un peu a l’ecart de la route principale.. erreur! 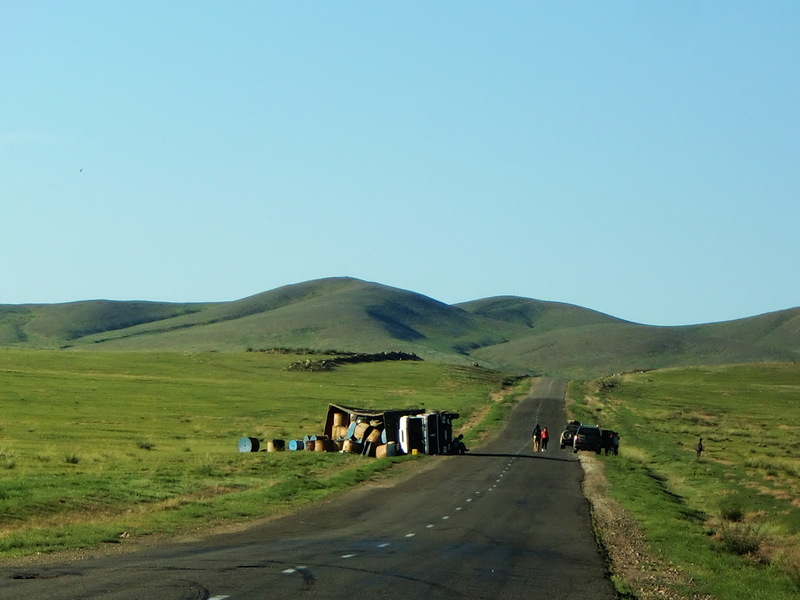 On a jamais retrouve la route principale.. On dit route mais en Mongolie, ce sont des pistes, et bien caillouteuses! On se dirigeait quand meme dans la bonne direction, car on traverse plusieurs rivieres qui sont marquees sur la carte. C’est plein de moustiques c’est l’horreur! Le pchitt anti-moustiques ne fait rien, il faut qu’on se couvre des pieds a la tete.. Puis on arrive le deuxieme jour a une riviere beaucoup plus grande.. Evidemment, comme on a quitte la route principale, on ne sait pas ou la traverser.. On est donc restes perdus pendant 4 jours! Avec la nourriture qui commencait a diminuer.. On reussit finalement a trouver ou on est sur la carte, et on trouve un petit village ou on achete plein de riz. Puis on rencontre un camion en longeant la riviere, toujours cherchant ou la traverser, et les gens nous montrent ou : la ou elle fait 30 metres de large et un metre cinquante de profondeur, ca nous arrive a la hanche… Sans parler du courant, plutot intense.. donc a traverser avec les velos et les sacs, merci! On decide de rebrousser chemin et de prendre la route du sud. 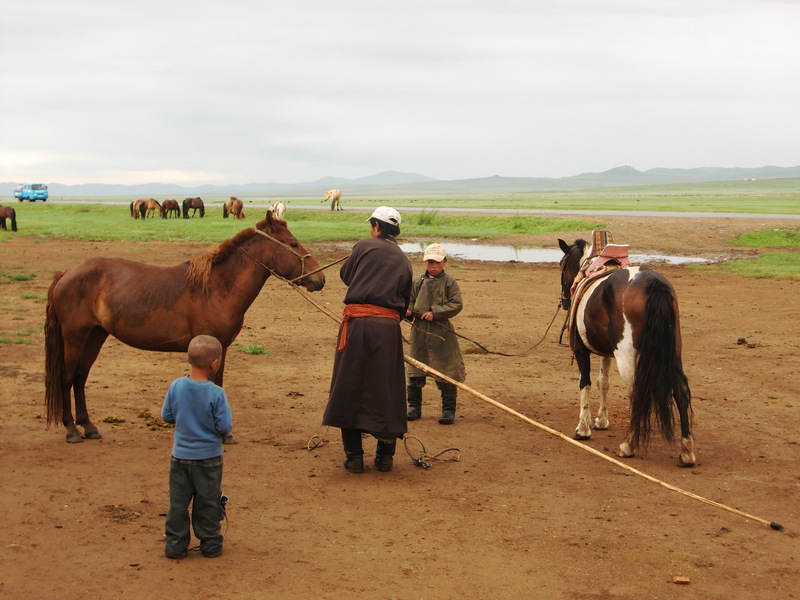 Le nord ouest de la Mongolie est repute pour ses orages violents, et on a pu le verifier : environ 3 par jours, et plutot terrifiants. Quand on voit l’orage approcher, on laisse nos velos et on marche un peu plus loin. On prend le toit de la tente pour se proteger et on s’assoit sur des bouteilles en plastique pour eviter la conduction si la foudre tombe pas loin. Eh ben ca secoue, ca souffle, ca mouille et ca fait meme mal quand la grele s’en mele! Le 3eme jour, Murat laisse malencontresement sa main par terre, et la foudre tombe juste a cote de nous! Du coup il se prend une petite decharge, on l’a jamais vu parle aussi vite! Mais il est sain et sauf, tout va bien! 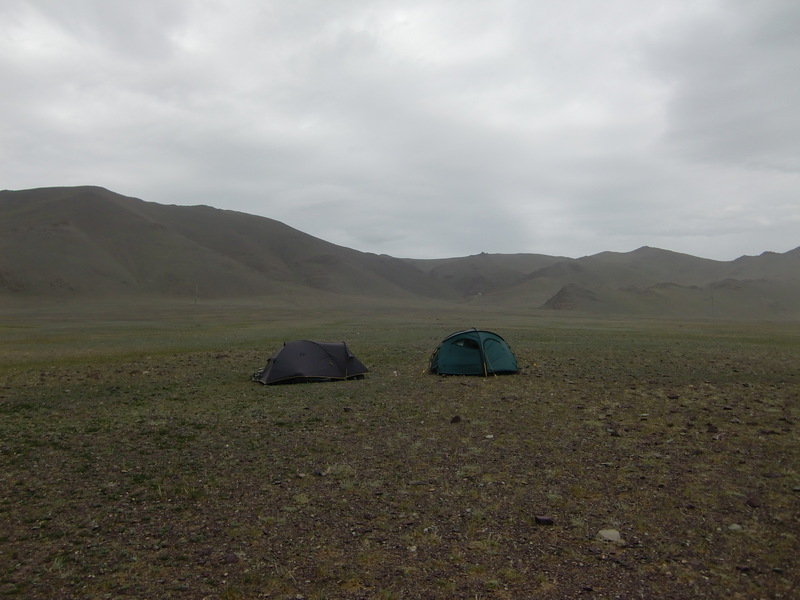 Donc on avait peur de manquer d’eau en Mongolie, mais entre les rivieres et les orages, finalement c’est de bouffe qu’on a faillit manquer.. On a meme campe un soir au pied d’une montagne sur un sol qui paraissait bien vert, et ca donnait envie vu la secheresse du sol.. Le soir l’orage approche, mais on ne s’inquiete pas, on est bien a l’abri dans nos tentes, et on a plein a manger! Il pleut bien bien fort, et sous la tente on sent de l’eau, ca nous fait comme un matelas remplit d’eau. On se dit qu’on est sous une flaque et que ca va passer. Carsten ouvre sa tente pour regarder et nous dit “oh y’a une riviere a cote, jpeux presque me laver les mains sans bouger! Tiens, je vais prendre une photo.” Une seconde plus tard on l’entend : “go guys, go! put your shoes on and go!” En fait on etait… dans la riviere!!! Donc on grimpe quelques metres a l’abri dans la montagne en portant nos tentes, sous la pluie et dans la nuit. Le lendemain on seche toutes nos vetements et on va chercher les quelques affaires qui s’etaient faites emportees un peu plus loin. Crazy! On retourne donc sur nos pas et on repasse par la route qu’on avait fait en stop, dans une vallee ou coule une riviere, c’est tres vert au milieu et tres rocailleux autour et dans les montagnes. On se fait inviter dans une yourte, on boit du the qui est principalement du lait et ils nous offrent des petits pains frits. C’est magnifique a l’interieur. On leur joue de la musique et ils sont tres contents. 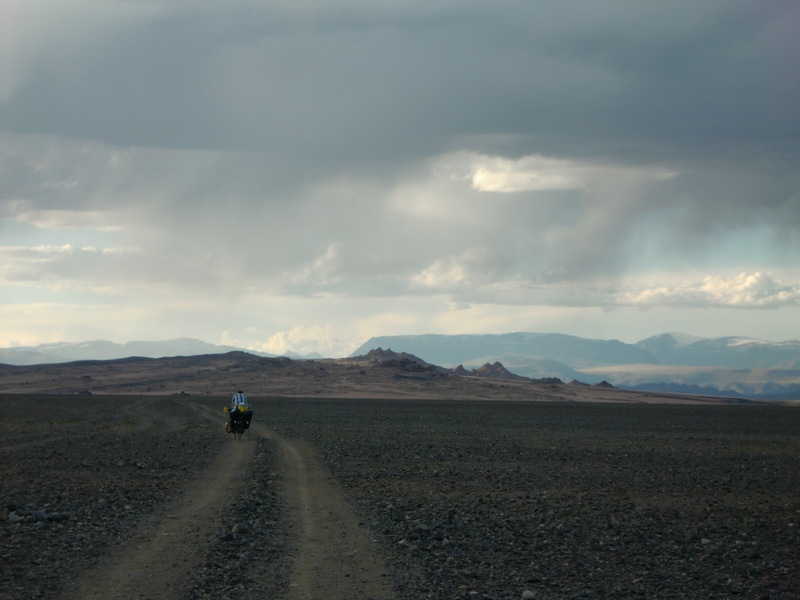 On a donc deja passe une semaine en Mongolie avec toutes ces histoires, et on a pas fait un km! Alors il faut un peu se depecher. On decide de se separer avec Carsten pour faire du stop, car c’est plus facile. Notre premier jour, on se fait prendre en stop d’abord par une jeep, puis par un camion ouvert transportant 4 chevaux et 8 hommes a l’arriere! Et ils nous prennent avec nos deux velos aussi! 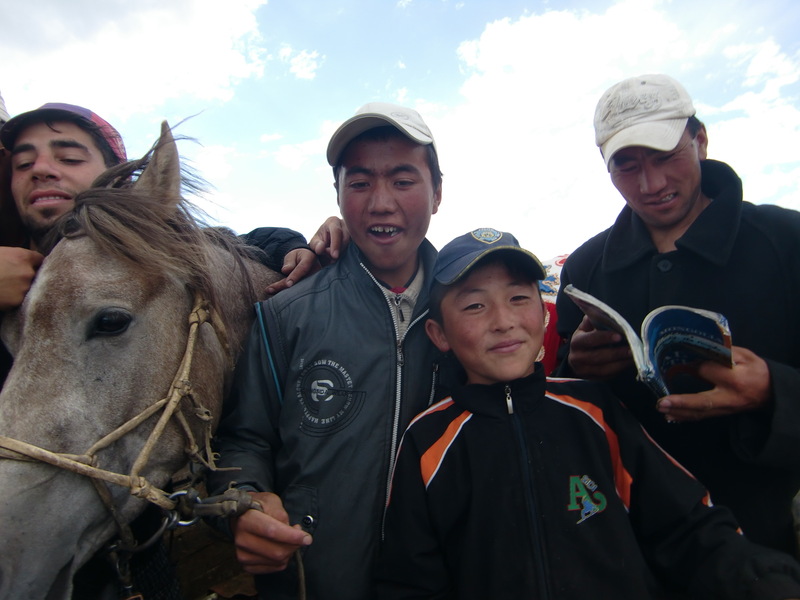 Ils sont tous contents car un de leurs chevaux a gagne une des courses du Nadaam, grand festival en Mongolie avec courses de chevaux, tir a l’arc et luttes. Ils nous deposent au prochain village ou on se ravitaille. Puis on est sur la route, la piste, avec un vent tellement fort qu’on peut meme pas pedaler! On est creves. Une jeep s’arrete devant devant nous et Carsten en sort, bourre a la vodka et avec un aigle dans les bras! Trop drole. Il n’y a pas de place pour nous.. Ils repartent. 10 minutes plus tard 2 camions passent! 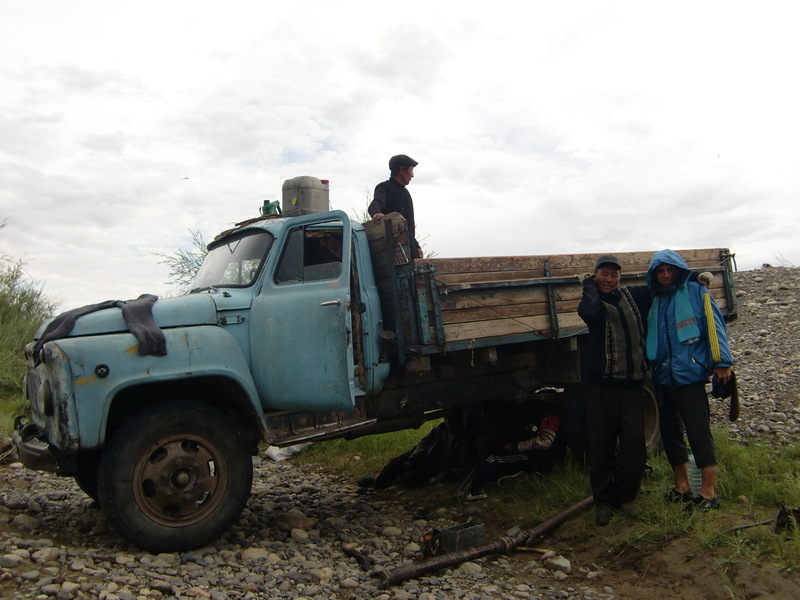 On les arrete car ils voyagent ensemble et ils nous prennent en stop jusqu’a 400km avant Oulan Bator, la ou il y a de l’asphalte et donc la ou on veut s’arreter pour enfin pedaler! Le soir meme ils se perdent dans la steppe, donc on s ‘arrete au milieu de nul part dans la nuit pour planter la tente, on n’est meme plus sur des pistes! Le lendemain on charge le camion avec de la laine brute : 20 tonnes! On y passe la journee car il n’y a evidemment pas de machine, tout est fait par une equipe de 7/8 mecs. Balaises les gars, chaque ballot de laine pese environ 100kg! Murat aide a charger at amelie ecrit combien pese chaque ballot. Le lendemain matin, alors qu’on roule on voit quelqu’un au loin courrir vers la route pour arreter le camion. C’est Carsten! Notre conducteur s’arrete et decide de le prendre aussi! Trop cool! C’est la qu’on decouvre qu’il est possible de manger vegetarien, meme vegan, dans les gers/yourtes! Et c’est pas cher, environ 1,50euros l’assiette, et plutot bien remplie. Et c’est bon! Les mongoles nous cuisinent du riz avec des pommes de terre, carottes et ognions a chaque fois. Apparemment ce serait meme meilleur qu’une assiete avec de la viande, car le mouton est tres fort ici et les etrangers ont du mal a manger ca tous les jours.